Having gone to high school with Jeffrey Dahmer, Derf Backderf tells a story of adolescence in the 1970’s that leads right up to Dahmer’s first murder. 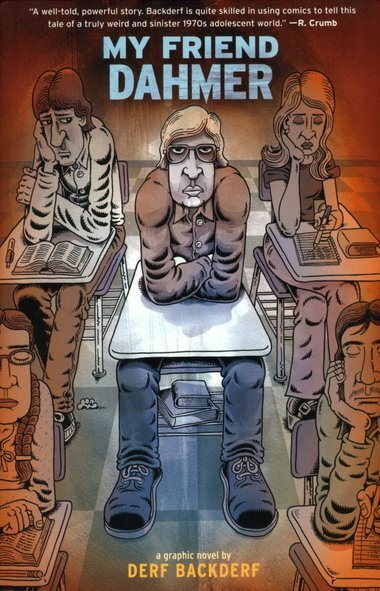 The story focuses on the high school experience and the strange outcast that brought Derf and his group of friends the occasional comic relief and concern. My Friend Dahmer is a graphic novel that is not so much a bloodbath as it is a prelude to the horrors that would surface in adulthood. It explores the mind of a teenager who simply shook hands with his prom date and denied his own sexuality. How could a teenager talk about the kind of urges that Jeffrey had with anybody in the social atmosphere of the time? It’s the kind of background story that few documentaries could capture with such intrigue without all of the bloody details. I heard about the graphic novel last year when Backderf was scheduled to speak at his Alma Mater, The Ohio State University. I couldn’t make it, and it wasn’t until a matter of months later that I found myself in a book store with My Friend Dahmer on the employee’s selection shelf. I don’t read too many comic books these days. On occasion I find a graphic novel so interesting that I devour it within a matter of a few short hours. This was one of those books as the storytelling in My Friend Dahmer is so fluidly perfect that for a moment, I was lost in Derf’s world.